Grave marker for Thames A. Anderson in Crystal Lake Township Cemetery North, Frankfort (Benzie county), Michigan. Thames enlisted in the army at Kalamazoo, MI on 19 June 1942. 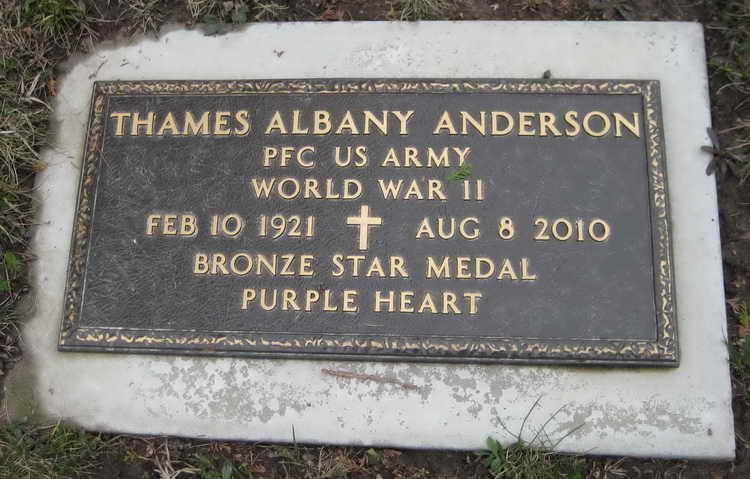 Pfc Anderson was transferred from the 551st PIR to Company D, 508th PIR on 11 February 1945. The Morning Report dates for his arrival and the instance of his being wounded in action are inaccurate as it records him being WIA the day before his transfer. Still hospitalized on 15 May 1945, he was transferred to the hospital's Detachment of Patients. He did not return to the regiment and was discharged from the Army on 27 March 1946. His military decorations include the Bronze Star (awarded post-war), the Purple Heart and the Bronze Service Arrowhead device for Southern France Campaign and Airborne Operations.